Alfred Nobel, known for the establishment of the prestigious Nobel Prize, was a Swedish chemist who invented dynamite. 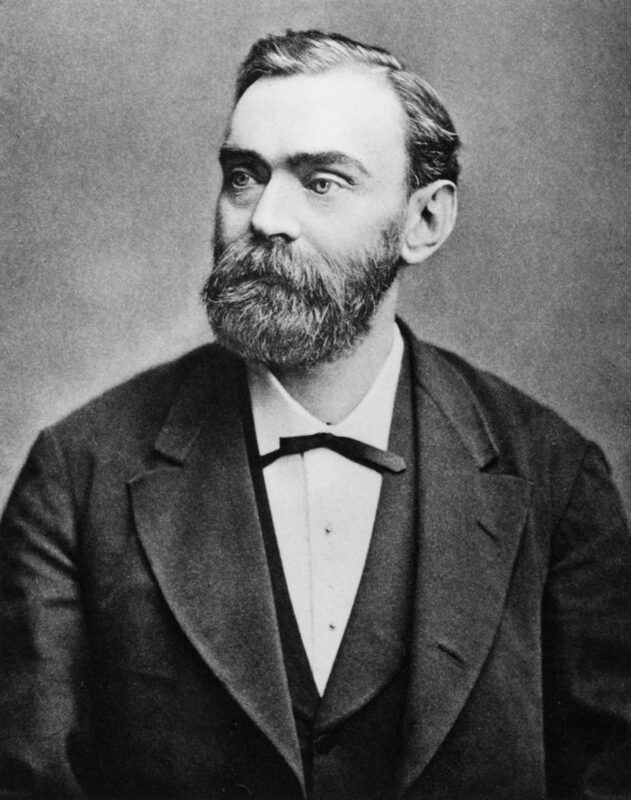 Alfred Nobel, son of Immanuel Nobel and Andriette Ahlsell, was born on October 21, 1833 in Stockholm, Sweden. Immanuel Nobel was an engineer and architect who built bridges and buildings in Stockholm. He was also a pioneer in arms-manufacturing and in steam engine designs. Alfred Nobel had seven siblings. Immanuel went bankrupt the same year Alfred was born and in 1837 moved to Finland, and then Russia, struggling to start a new business. He started a mechanical workshop in St. Petersburg that provided equipment for Russian Army. He also worked on naval mines and showed to Russian Army that they could be used to stop enemy ships from entering and attacking St. Petersburg. Immanuel’s idea was successful during Crimean War (1853-1856). His business prospered there and he moved with his family to St. Petersburg in 1842. Alfred Nobel and his three brothers were given first-class education through private tutors in natural sciences, languages and literature in Russia. By the age of 17, Alfred could communicate in Swedish, Russian, English, French and German. He was interested in English literature, poetry and chemistry. In 1850, his father sent him abroad for training in chemical engineering. During that period, he visited Sweden, France, Germany and the United States. In Paris, he worked in the laboratory of T.Jules Pelouze, a famous chemist, for one year. In the U.S. he spent four years working under a Swedish-American inventor, John Ericson. On his return to Russia, he worked in his father’s factory. Along with his focus on explosives, he also experimented in making leather, artificial silk and synthetic rubber. In 1856, the Crimean War ended and Immanuel Nobel’s company went bankrupt as Russian army cancelled orders. Alfred’s parents and his youngest brother Emil returned to Sweden. During this time, Alfred Nobel started experimenting with an explosive chemical substance called nitroglycerin. Nitroglycerin was first invented by Italian Chemist Ascanio Sobreroin in 1846. The only explosive used those days was gunpowder. Nitroglycerine was a more powerful explosive than gunpowder but it was very unstable and had not been brought into practical use. Alfred worked on controlled detonation of nitroglycerine so that it could be used safely in construction work. In 1863, he went back to Stockholm and obtained his first patent on blasting oil, a blend of nitroglycerine and black powder, which was a basic explosive. He invented a detonator called blasting cap for triggering the explosion of nitroglycerin. In 1864, he started a company in Stockholm for the manufacturing of nitroglycerine as an explosive. But soon the government banned the experimentation with nitroglycerine within Stockholm city due to little knowledge of the chemical compound which caused several explosions and numerous casualties including that of his brother, Emil Nobel. Alfred moved his experiments to a large boat on Lake Malar, Sweden. In 1865, he started a factory for nitroglycerine production in Germany. In 1866, Alfred found that nitroglycerine could be stabilized by mixing it with a siliceous deposit called ‘kieselguhr’, thus inventing dynamite – his most acclaimed invention. In the same year, he established United States Blasting Oil Company in the USA. In the following year, he patented his invention of dynamite in Sweden and also received an honorary award from the Royal Swedish Academy of Sciences for “important invention for the practical use of mankind”. Victor Hugo – a famous French poet and novelist – once described him as “Europe’s Richest Vagabond”. That was an era of rapid industrialization and invention of dynamite drastically reduced the cost of construction work. Alfred’s business of explosives expanded and over the years, he established about 90 factories and laboratories in more than 20 countries. He lived in Paris but he spent most of his time travelling to his factories. In 1875, he invented blasting gelatin, a more powerful form of dynamite. Along with his focus on explosives, he also experimented in making leather, artificial silk and synthetic rubber. In 1887, he invented a smokeless blasting powder called ballistite. Nobel offered ballistite to French army but they rejected it. In 1889, he sold the rights for the use of ballistite to Italy. As France had conflicts with Italy, they marked him as a traitor. Due to this reason, Alfred left Paris and moved to San Remo, Italy in 1891. There he died on December 10, 1896, at the age of 63. By the time of his death, he had 355 patents and Victor Hugo – a famous French poet and novelist – once described him as “Europe’s Richest Vagabond”. In his lifetime, Alfred wrote poems and plays and also built up a large book collection of his favorite literature. After his death he left a private library containing over 1500 volumes of fiction, classics and works by great writers, philosophers, historians and scientists of his time. Alfred Nobel never married. In 1888, Alfred’s older brother, Ludvig Nobel died while he was staying in Cannes, France. The French newspaper confused him with Alfred and reported his death as “The merchant of death is dead”. Alfred was shocked to find the way people perceived him. He wanted to be remembered for his good work. Perhaps that was the point when he decided that much of his fortune was to be used for the establishment of an endowment fund to honour the achievements of people who have done their best in the field of physics, chemistry, medicine or physiology, literature and peace. It took four years to execute Nobel’s will and the first Nobel Prizes were awarded in 1901.